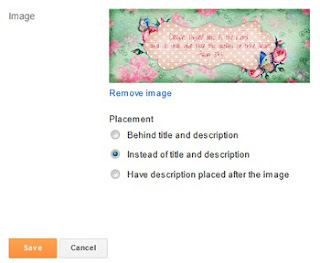 The blogger template I’m using is probably one of the most popular ‘Picture Window’, but this tip can be used with most any template! The problem is the width of my blog is actually wider than my pretty header image. Don’t you just love this pretty header? It was a freebie from Keren, find it here at Free Pretty Things for You! Before I added it to my blog I brought it into Photoshop and added a lovely verse! But it would look a lot better if it were centered on top of my blog! So here are a couple of quick steps to make that happen! All Done!! Oh that is so much better!! Below are a few extra aligning tips for your headers!! It has been such a pleasure to share this tip with you today! Feel free to share your comments or questions below! « Black Friday/Cyber Monday Deals Linky Party! Thanks for the enthusiastic feedback Andrea!! We would love to hear thoughts on future tips and tricks too!! Thanks a bunch! i’ve been looking for this tutorial. helpful as always! thank you so much, tiffany! this was super helpful and easy to follow. i’ll be by to visit your blog soon! Thank you sooooooo much for this!! I’ve been trying to find a simple way to do this for ages without having to go into the html code! Thanks for the great tutorial. I had found a way to cheat so that my header looked centred but after creating a new one to match the badge I created, it was best to learn to centre it properly. I’ve had an appt. to visit this post in my calendar since I came across it in November so was finally able to put your tutorial to use. Thanks again for the great tips! You are amazing! I’ve been searching for soo long for that answer! Thank you so much, you are a blog-saver!! Thank you so much for sharing this tip! I’ve been trying to make my own template, and centering the title has been driving me crazy!!!!!!!!!! Thanks for explaining this tip so well! Several other people had the same tip but they had me rooting around editing the CSS directly, whereas this elegant solution fixed my problem in a couple of minutes. Thank you! This was super helpful ! Thank you so much for posting this easy to follow code! The CSS trick took 5 seconds for me! THANK YOU! Thank you thank you! I found your tutorial via Google and it worked perfectly! Thank you so much! I was wrestling with that one for a while! I have taken an extended vacation from blogging and have to learn how to do all of this again. Thank you so much for this post. Saved me from pulling my hair out! I’ve been looking for something like this tutorial for what seems like forever. And I’m glad I found it. Thank you for being awesome! Now i can do a lot with this, and get my blog up and running smoothly. Do you have any other tips on here? Would really be great help. thank you so much for this entry! anytime i google ‘how to….on blogger’ i come across tutorials that are either impossible to understand or you follow it to the letter and it still doesn’t work. not this time! you make it so easy to understand and achieve the desired result. THANK YOU for this tutorial! I was getting so frustrated that it wouldn’t center and was thankful to find this for help! thank you so much for this. it really helped me a lot. This is great! Thanks so much I used it for my blog. Thank you so much. You just saved me a ton of time in photoshop. Thanks a ton, this was really helpful :D ! Thanks so much for this blog post! It was really helpful. THANK YOU! Worked a charm! oh my gosh….thank youuuu soooo much for this!!!! 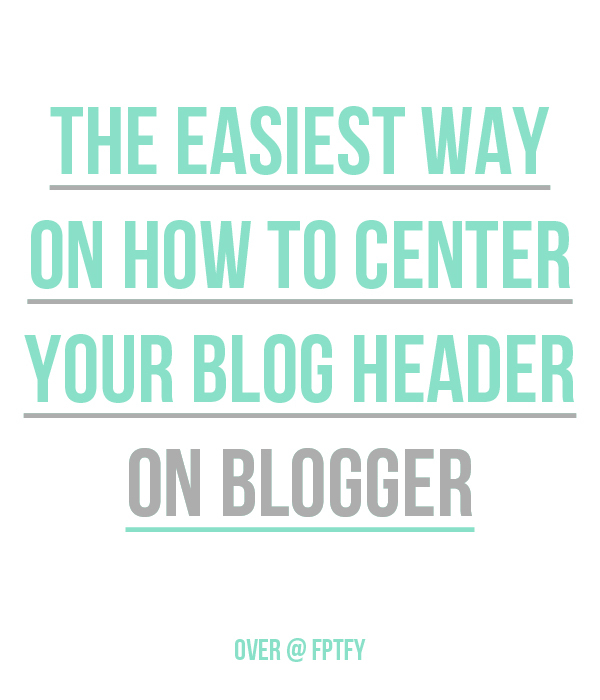 I’ve been trying to figure out how to center my blogger for forever now. I went thru and did what you said and it still didn’t work….so then I read it again…and I realized I didn’t press “enter” after I entered the code snippet. I now have a nice, centered blog header. Thank you again!!!! Thank you so much !!! I was about to start throwing things trying to get my header centered. Thank You! This was the most straightforward and easy answer I found today. Everyone else has you running through the HTML looking for specific lines. THANK YOU SO MUCH FOR THIS!!!!! I’d been trying to do this for ages, just free styling my way around the edit section, changing the sizes of the pictures I was using, the width of my page, even my whole template! Then, I found this, and MY did it help! Once again thank you so much for this!!! Thank you for this. I’m a first time blogger, learning every step of the way. Stumbling over little nuggets like this makes a world of difference. Your time invested in making this post is appreciated. This was soooo helpful!!!! Thank you so much! You my dear are a life saver, thank you for posting this! Hi! I’ve tried to use this but it didn’t work, and I think it may have something to do with my adjusted widths of my blog. Is there any way you can help me out? Thank you so much! I just had to Google once, and yours results were on the first page and my first attempt and it worked! TQ! Well done! My blog looks pretty enough. Thanks, really I need this. Thank you!! Very helpful info!! Exactly what I needed! Thanks tons!!!!!!! Thanks so much for this so helpful!! This is soooooo amazing! Thanks for the tip! Love it! Amazing!! Easy instructions and it worked perfectly…. a centred blog header :) Thank you! This was helpful! after how many weeks of looking for how to do this. Terima kasihhhhhhhhhhhhhh, thank u sooooooooooooooo much indeed. It’s very helpful indeed …;this is d one i looked for. thank you so much! this really helped me make my blog look more professional!! OMG!! this is so awesome!!! Thanks so much!! It worked like magic :D Im so happy!!! Thank you so much! This was driving me bonkers! it doesn’t work for me :( don’t know what i’m doing wrong! i paste the code in the CSS box and apply it but nothing changes and the code is just written at the top! Thank you sooooooooo much! It was driving me nuts that my banner was not centered and I am OCD so that makes it worse :) But I followed your steps and it is now centered. So thank you! Thank you thank you thank you! Thank you! This helped me soooooooo much. I am OCD and seeing that my banner was not centered drove me nuts :) I followed your steps and my banner is now centered! Thank you thank you thank you!! Ahhh this is brilliant – thank you! Thank-you for this – it works wonderfully and my blog looks so much better. Oh my gosh! Thank you so much for that easy trick. Worked like a charm. This was perfect and so incredibly easy with your help! Thank you!! Thanks so much!! That helped me a lot with my blogs. This helped me so much, thank you! Thank you so much–you saved me so much time! I was tearing my hair out! AHHH! Thank you so so so much!!! Thank you so much for this!!!!! I am new to the whole HTML thing. I was so exited that this worked for me, and it was easy to understand your instructions too. Hello! This was simple and easy to follow! One thing worth adding maybe is that you have to erase the code that is already there, then add the new one :) I know its common sense to most, but I didnt do this first and then went back and did it and saw the centered banner after that! Thank you again! THANK YOU SO MUCH! I have been trying to figure out how to center my header picture for months now and have had no luck finding information, until your post! Now my blog doesn’t look crooked! Woot! Works like a charm, thank you! I tried a few other sites and only yours worked out. Thank you! Thank you so much for this tutorial. :) Helped me a lot in centering the header of my other blog. Kudos! Thank you so, so much! I was having such a hard time until I found your post. Didn’t realize that different code was needed for “behind title and description”! Dear Tiffany, tq soooo much. Your tips really help me! Thank you sooooo much! It was so easy, I was afraid it wouldn’t work. I found this when I was about to give up on getting my photo centered. Brava! I’m just venturing out into the blogging world so this post was so so helpful and easy to follow! Thank you! Thanks a ton! I have been looking around for such an awesome solution to center my blog header.! It worked n seconds! But the page tab… It still is from the lefft most corner.. Any way to bring that to center too? Thank you so much! This was exactly what I needed! So easy! Thanks for the awesome tip!! Worked perfectly! Thanks! You’ve got amazing tips and this article helps me so much! :) You’ve got a follower and big fan also from Slovakia!!! THANK YOU! :) LOL I have been working on this all day as a newbie. This was so easy. Wow. I literally spent the last 3 days trying to figure out how to center my logo in my header. Finally I did what I swore I wouldn’t do, ask Google. Needless to say your very informative sight came up, and your instructions are clear and to the point and I fixed the issue in 30 seconds. I greatly appreciate this blog, and will be bookmarking it for future reference. Thanks a million, and a million again. omg thank you! This was driving me NUTS! Thank you so much for sharing this! It was driving me nuts that my blog header (hlshop.blogspot.com) was off center and now it looks perfect! This worked like a charm! Thank you for the help! Thank you so much! I always forget how to do this. It is so nice to come here and have the instructions put out so easily for me to follow and understand! Thank you so much for all the kind things you bless me with! Omggg, this is so easy to make my header to center, i dont have to edit html. Thanks! This worked for me ! Thank you so much for this info. I was breaking my head over how to center my header. Thank you this was super helpful! Just read your centre header text advice. Very helpful thank you. Oh my gosh, thank you so much! Simple and easy to understand. Thank you so much!! It is so easy to understanding~ Help me a lot! Thank you so much! I was starting to pull my hair out!!!! Thank you for helping me center my blogspot title! Worked like a charm – THANK YOU!!! WOW! I hadn’t messed with my blog’s layout in ages. This new CSS thing is awesome! Go Technology! Omg I love you so much for this. Thank you. Thank u! your post is sooooooo useful for me! I believe that I can make my blog myself because your kind tip! Thanks!! This is really a help. Thank you so much! This was so so helpful! I was going crazy trying to work out how to make my header centered!